The first agri-bulk vessel for global animal feed trader ADM Arkady arrived at Peel Ports’ King George V Dock this week, containing more than 4,000 tonnes of animal feed. The arrival of Arklow Ruler at the Glasgow-based port, marks a significant first milestone in the long-term contract between Peel Ports and the supply chain leader which was announced earlier this year. At around 90m in length and weighing in at around 6,965 tonnes the vessel arrived from France. Peel Ports has extensively refurbished the on port agri-bulks storage facilities at KGV to ensure the highest standards of compliance are achieved to bring them in-line with other Peel Ports operated facilities. The works also included investment in a new IT platform as well as plant and cargo handling equipment. The TASCC and ATEX compliant warehousing will become ADM’s new Scottish distribution hub. 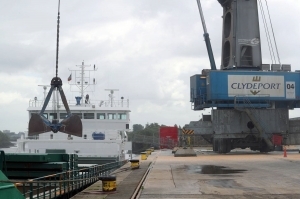 Graham Atkinson, Managing Director, ADM Arkady said: “The arrival of our first agri-bulks vessel carrying maize marks a significant milestone in our partnership with Peel Ports and will soon be followed by an extensive programme of animal feed imports. As well as developing Peel Ports Glasgow port facilities, ADM Arkady will also expand its northern hub operations in Liverpool and could see a combined throughput of 1m tonnes of animal feed imports each year. Andrew Hemphill, Port Director at Peel Ports Clydeport, said: “Since announcing our partnership, we have upgraded the storage and distribution facilities at KGV in order to accommodate ADM’s business model and ensure an effective route to market for its products.